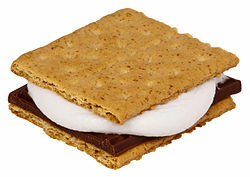 National S'mores Day is celebrated yearly on August 10 in the United States, according to Wikipedia. We didn’t know about National S'mores Day when the Skupien clan gathered in Smoky Mountain National Park at the end of July. But we certainly celebrated the S’mores tradition. After evening meals the ingredients for s’mores appeared and prompted action around the fire pit among kids and adults. I think every family came supplied, and s’mores were on the dessert menu no matter whose campsite was our dinner venue. 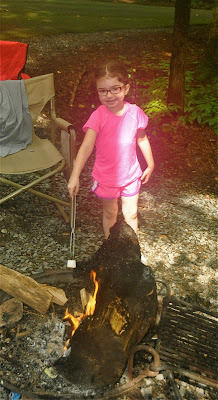 Granddaughter Molly Kate works on her marshmallow-roasting skills. That description fails to include the delicious reality: a marshmallow roasted to a golden brown on the outside and liquefied on the inside then layered with a slab of chocolate between two graham crackers. Then there is the entertainment value, competition for the best roasting job and the fascination and delight that youngsters experience as they create "Cajun" marshmallows that flame, are blown out, blackened beyond an adult's taste tolerance. The enthusiastic s'mores fans among our young campers behaved as if the charred marshmallows were the essential ingredient that made their s'mores a true delicacy. You are making me hungry! Thanks for the Molly Kate photo, you know she is my favorite!!! I know there should be no favorites among children, but I can't help it, she is just adorable! Love s'mores and your family tradition. they always make me nostalgic for my kids' growing up years. That looks like the best fun ever for kids. Well adults too. I always went to camp, but I have no memory of having a s'more. I've been cheated. Our little "grands" enjoyed s'mores on Friday evening, and we didn't even know the next day was 'National S'mores Day'!